(NewsUSA) - Driving safely in the winter can be a challenge, even for the most experienced driver. In fact, an alarming three in five winter drivers (61 percent) have lost control of their car during winter weather, according to a new winter driving survey by Michelin. It comes as no surprise, then, that three quarters of respondents reported feeling nervous on winter roads (77 percent), with 64 percent of drivers saying they avoid winter driving altogether if the forecast predicts snow. But you don't have to avoid getting in your car in the winter. With a little preparation - starting from the ground up (literally) - you can travel safely even when the weather is less than ideal. "Tires are one of the least-discussed safety devices on your vehicle, so many consumers aren't aware of just how much they contribute to keeping you safe on the road," says Ron Margadonna, Michelin winter tire expert. Michelin urges all drivers to use the proper tires for their seasonal climate. Most cars these days come outfitted with all-season tires, but if you live in an area with severe winter conditions (heavy snow, ice or freezing temps), they may not be sufficient. 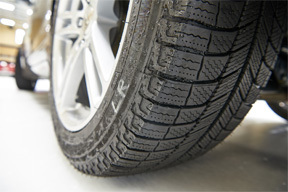 All-season tires are designed to perform well in a large range of conditions, but aren't built to handle winter's worst. Alternatively, winter tires such as the Michelin X-Ice Xi3 are designed to perform better in a wide range of wintry conditions, such as wet roads, snow, ice and freezing temps. They also improve your vehicle's grip and performance in these conditions and shorten your braking distances for better safety. • Inspect your lights: Examine your headlights and brake lights to ensure that they're fully functioning. This is especially important during winter fogs or heavy snow. • Make sure your wipers are in proper working condition: Buy washer fluid with antifreeze solution to protect visibility and ensure that windshield blades are in good working order. • Always have an Emergency Kit: Carry an emergency kit with gloves, blanket, flares, a shovel, flashlight, water, extra batteries and cell phone charger, as well as an emergency contact list with important phone numbers. • Check your battery: Battery capacity is decreased significantly by cold weather. Before the winter months, have your mechanic check it to ensure that it's at peak performance. It's also a good idea to carry jumper cables in your car, should you ever need someone to give you a boost. For more information, visit www.michelinman.com.